Tiaina Baul Seau Jr. was born on 19 January 1969, in San Diego, California USA, and was a professional American Football player, best known as a linebacker in the National Football League (NFL). He was inducted into the Pro Football Hall of Fame, and was a 12-time Pro Bowl selection. He died in 2012, but all of his efforts have helped put his net worth to where it is today. How rich was Junior Seau? As of mid-2016, sources estimate a net worth that was at $12 million, mostly earned through his success in professional football. When he was playing, he reportedly earned $1 million annually thanks to his NFL contract. He was named to the NFL 1990s All-Decade Team, and all of these ensured the position of his wealth. Seau attended Oceanside High School and during his time there played various sports including football – he was a starter linebacker and also played tight end. During his senior year he was the Avocado league offensive MVP, and helped his team win the San Diego 2A Championship. After matriculating, he attended the University of Southern California but had to sit out his freshman year to work on his grades, bringing a lot of criticism from relatives, friends, and neighbors. He bounced back and lettered the next two seasons; during 1989, he was a unanimous first-team All-American selection. After his junior year, he entered the 1990 NFL Draft and was selected as the fifth overall pick by the San Diego Chargers. He quickly became one of the most popular players on the team, and was given the nickname after the cartoon character “Tasmanian Devil”. He started 15 games in his rookie season, and was an alternate during the 1991 Pro Bowl. He continued by racking in a lot more tackles and sacks during his second season on the way to a Pro Bowl selection – this was the start of his 12 consecutive Pro Bowl appearances. He started at least 13 games for each of his seasons, and achieved a career high 155 tackles during 1994, being named the NFL Defensive Player of the Year, and helping his team reach Super Bowl XXIX. Prior to their Super Bowl appearance, he recorded 16 tackles during the 1994 AFC Championship Game which was one of the best performances of his career. His great run with the Chargers ended in 2002 with an ankle injury, and a career low in tackles. Regardless, his net worth conti ued to rise. The following year, he was traded to the Miami Dolphins, and became one of their best defensive players. However in 2004, he suffered a torn pectoral muscle that limited his games, and his bad luck continued with an Achilles tendon injury that put him on the injured reserve list. In 2006, he was released by the Dolphins and announced his retirement, but later signed with the New England Patriots. He would go on to perform well before suffering a broken arm which put him on the reserve list again. He signed with the Patriots once more in 2007, and became part of their undefeated regular season. They reached the Super Bowl but lost against the New York Giants. He continued to play for the Patriots in the 2008 season for a few games. and played a few more games the following year. In 2010, he announced that he was retiring permanently via “Inside the NFL”. After retiring from football, he opened Seau’s The Restaurant which became a highly successful venture. He also opened his own clothing line and had a show called “Sports Jobs with Junior Seau”. His net worth continued to rise. For his personal life, it is known that Junior married Gina Deboer in 1991 and they had three children together but divorced in 2002. He also has a son with high school sweetheart Melissa Waldrop. In 2012, Seau was discovered in his home with a gunshot wound to the chest, and police found lyrics about a song entitled “Who I Ain’t” which is about a regretful person. No evidence of brain damage was found, but he was suspected to have been affected by CTE which caused depression. This prompted his family to sue the NFL over the injuries Junior sustained during his career. 1 When you're putting your kids to bed and their prayer at night is 'God, please let Daddy win, sometime,' you know it's getting bad. 2 Whenever the defense needed to get off the field, we didn't execute. We recognize that, and hopefully it won't happen again. 3 It's one game. After one game, you're going to be in first place or last place. We're in first place. 4 Whenever you get in that situation in the course of a game, you hope to get one tackle. To make three tackles is a career in the National Football League. 5 If you look at the history of the game it has happened to every great player: Joe Montana, Jerry Rice and Marcus Allen. You can go down the list, that there is transition. 1 Inducted into the Pro Football Hall of Fame in 2015. 2 Inducted into the Polynesian Football Hall of Fame in 2014 (inaugural class). 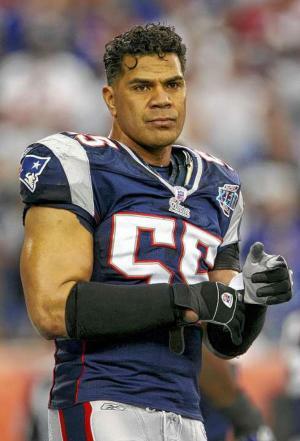 6 (Thursday, January 10th, 2013) Following a post modem examination of his brain, his family announced that Seau suffered from chronic traumatic encephalopathy (CTE), a progressive degenerative disease caused by repeated head trauma. 7 According to the autopsy report released by the San Diego County medical examiner, Seau was completely sober when he shot himself in the chest and his cause of death has been ruled as a suicide. 8 A member of the Laurel Elementary School (Oceanside, California) Hall of Fame. 9 His Seau's The Restaurant was named "Best Sports Bar" by the San Diego Restaurant Association. 10 He and now-ex wife Gina posed for the 2000 Sports Illustrated swimsuit issue. 12 He and ex-wife Gina Seau have 3 children: daughter Sydney Seau (born on Friday, August 27th, 1993) and sons Jake Ryan (born on Wednesday, October 18th, 1995) and Hunter Tiaina (born on Monday, September 11th, 2000). Seau's first son Tyler Seau was born in June 1989 by Melissa Waldrop. 13 Drafted in 1990 by the San Diego Chargers in the 1st round (5th pick) out of USC. 14 Did not begin speaking English until he was 7. 15 An ethnic Samoan, his parents, Tiaina Sr. and Luisa, were born on the island of Aunuu in American Somoa. 16 The 5th of 7 children. 17 Named to the Pro Bowl 12 times.